Value of card: Rabies! Rabies! Synopsis: Just as in the card, Skip again gets squeezed out by the Rally Squirrel. 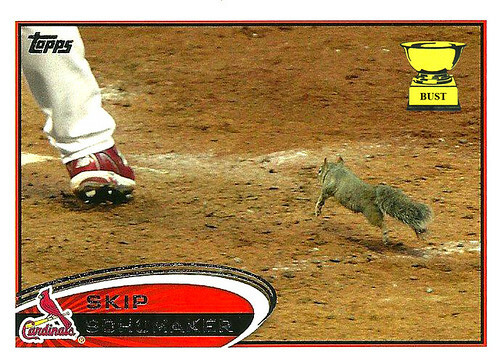 Of course, at the end of the 2011 season, Schumaker had won a World Series and the Rally Squirrel had been captured and released into the wild, so Skip can't have that much to complain about.